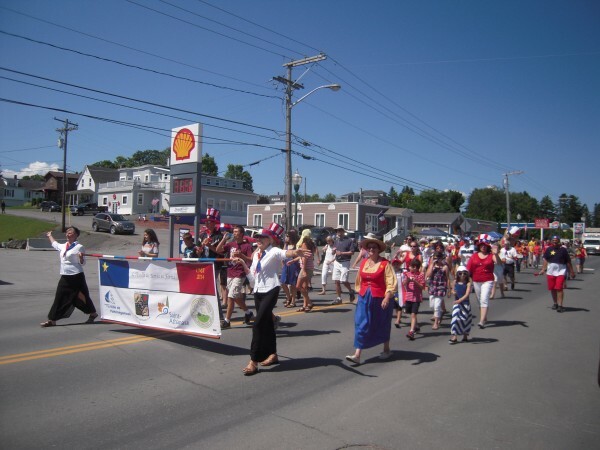 World Acadian Congress organizers Lydia Martin and Pat Ezzy lead Van Buren's Tintamarre down Main Street to the international bridge to St. Leonard, New Brunswick, on Aug. 10, carrying a banner bearing emblems of four communities that joined to celebrate the Congres Mondial Acadien 2014: (from left) Pohenegamook, Quebec; St. Leonard, New Brunswick, Saint Athanase, Quebec; and Van Buren, Maine. I think I have understood what it means to be Acadian, but last weekend I felt it. I have read about the deportation and migration of Acadian people from Nova Scotia to Maine, Louisiana and New Brunswick in the 1700s. I have been to Grand Pre, Nova Scotia, where Acadians were banished from their homes by the British in 1755. I often visit the site beside the St. John River in Madawaska commemorating both the landing of Acadians in northern Maine and the annual reunions of families descended from the original settlers. I have enjoyed Acadian music and theater at the Musee Culturel du Mont-Carmel in Lille and the University of Maine at Fort Kent. I have attended Acadian festivals in Madawaska and published dozens of stories celebrating Acadian culture written by and about people from the St. John Valley in Echoes magazine. But participating in Van Buren’s launch of the World Acadian Congress last weekend moved my sense of what it means to be Acadian from the intellectual to the emotional and spiritual. I could feel the pride among the hundreds of people gathered Friday morning in the gymnasium at Van Buren High School for breakfast and viewing of the opening ceremonies of the Congres Mondial Acadien live-streamed from Quebec and projected on a big screen. I was welcomed to a table by women eager to share their secrets for variations on the ployes and creton included among the offerings for our hearty breakfast. Throughout the hall, people who had been punished for speaking French as children spoke their language freely and sang French songs joyfully. I learned the notes, if not the words, of “C’est le temps,” written by Van Buren natives Mike and Pat Ezzy, which would become the theme song of Van Buren’s Acadian celebration. I was seated next to three women attending the Forest family reunion. Symbolically, they were from Nova Scotia, Louisiana and Chicago. “Like Acadians in 1755, refugees today — in 2014 — are being persecuted on a mountain in Iraq,” said the Rev. Jacques LaPointe in opening remarks dedicating the service to refugees around the world. “We were supposed to disappear, but we survived because we reached out to others.” LaPointe expressed hope that some time in the future today’s refugees would be able to celebrate their survival with festivities like the World Acadian Congress. I was swept into Van Buren’s Tintamarre, led by event coordinators Lydia Martin and Pat Ezzy. Down Main Street and across the international bridge from Van Buren to St. Leonard, New Brunswick, we marched, greeted in Canada by a cheering crowd and border officials steering us toward check-in windows. At first, I was inclined to ask people where they were from. Like Mainers, New Brunswickers were decked out in red, white, blue and yellow. They blended together, and that was the point. Before 1842, St. Leonard and Van Buren were La Grande Riviere, one community that spanned the St. John River. The river unified the people on its shores. Family farms extended from one side to the other. Even though the Webster-Ashburton Treaty made the river the boundary between Maine and Canada, the two towns retained a sense of community. The bond between Van Buren and St. Leonard has been extended for the Acadian Congress to include two communities in Quebec. Residents of Pohenegamook and St. Athanase, Quebec, became honorary citizens of Grande Riviere in a ceremony last April in Van Buren, and the four towns will celebrate the closing of the CMA together in Quebec on Aug. 24. I will be there because townspeople continue to reach out, demonstrating the generosity that meant survival for Acadians in the 1700s. I will never be able to claim Acadian heritage, but I feel its strength, rooted in a history of persecution, throughout the St. John Valley. I, too, hope that the suffering of the world’s refugees will end with a Tintamarre.